Looking for a midsize SUV but want to optimize power, safety, and technology? This is the case for many drivers, however few vehicles have what it takes to fulfill these needs. Thankfully, the 2019 GMC Acadia offers the best of everything. From its impressive performance capabilities to its high tech features, there’s nothing you can’t check off your list with this midsize SUV. For drivers searching for the ultimate in entertainment technology, the 2019 GMC Acadia offers some of the markets most premium features, including the GMC Infotainment system with the choice of either a 7-inch touchscreen display, 8-inch touchscreen display, or an 8-inch touchscreen display with navigation. Standard features on every model of this SUV include Bluetooth, Apple CarPlay, Android Auto, and 4G LTE WiFi. For the power-hungry driver, the Acadia is an easy choice. The available V6 engine pleases consumers with up to 310 horsepower and 271 lb-ft torque. Handling and acceleration are also top-notch on this SUV, with critics noting that it is easy to maneuver and accelerates with ease. Even when it comes to fuel efficiency, the 2019 GMC Acadia has some of the highest ratings in its class. On the highway, drivers can experience up to 26 mpg, while in the city the Acadia offers 21 mpg. Safety tech is abundant on the 2019 GMC Acadia, and even that is a bit of an understatement. Whether you’re looking to purchase the base trim or the highest trim, you can look forward to a hefty list of standard safety features. A few of the most notable safety features on the base trim of the Acadia include a Rear Vision Camera, Teen Driver Technology, Passenger Sensing System, and Daytime Running Lamps. Meanwhile, the higher trim levels offer features like Forward Collision Alert, Rear Cross Traffic Alert, Adaptive Cruise Control, and Lane Keep Assist with Lane Departure Warning. 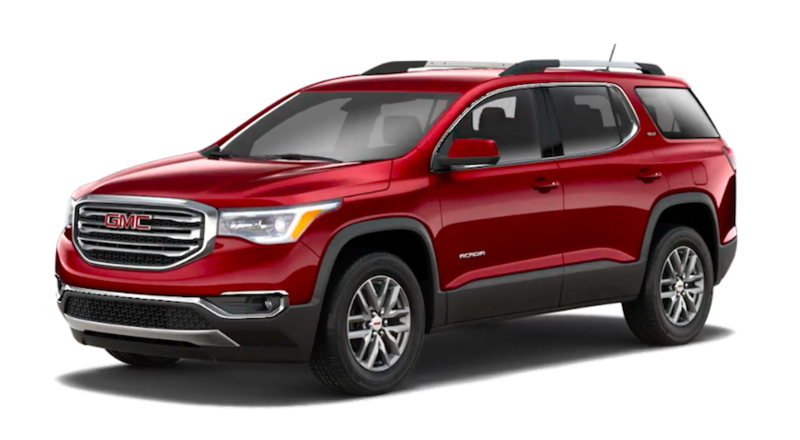 If you’re looking for a comfortable vehicle for up to 7 passengers, while maintaining competitive efficiency, impressive power, and enough technology to satisfy a full cabin, the 2019 GMC Acadia could be the perfect vehicle for you. However, when choosing your next vehicle it’s important to dig deep into your research and truly discover everything that your top-contenders have to offer. To help get you started, we’ll take a look at a few of the most important automotive categories and discuss how this incredible SUV competes at the top of its class. In every category of performance the 2019 GMC Acadia excels among others in is class. This is largely due to the vehicle’s impressive engine options, which include the standard 2.5L 4-cylinder and the available 3.6L V6. The 4-cylinder engine produces a 193 horsepower and 188 lb-ft torque, while the V6 engine offers an amazing 310 horsepower and 271 lb-ft torque. If you’re interested in having one of the most powerful midsize SUVs on the market, you’ll want to opt for the 3.6L V6 engine. However, even the standard 2.5L 4-cylinder engine remains competitive in its class. When it comes to the Acadia’s drivetrain, front-wheel drive is standard but all-wheel drive is readily available as well. The 2019 GMC Acadia is also one of the most fuel-efficient midsize SUVs on the market, offering drivers up to 21 mpg in the city and 26 mpg on the highway. These numbers are even high enough to contend with many of the full-size sedans available for this model year. Drivers and critics also note that the Acadia features responsive and smooth handling, making each ride incredibly enjoyable. With its powerful engines, acceleration is another area where the 2019 GMC Acadia excels. Overall, you can be sure that this vehicle with have the maneuverability, power, and efficiency you’re looking for, which is a combination very few vehicles in its class offer. Drivers should also note that upgrading to the Acadia’s available 3.5L V6 engine will slightly decrease the fuel efficiency of the vehicle, however, even with this decrease the Acadia still sports impressive ratings. In addition to these available features, the 2019 GMC Acadia offers some impressive packages geared towards the driver looking to further enhance their vehicle. For drivers prioritizing the latest in tech, one of the best packages may include the Technology Package. This package adds Surround Vision, Adaptive Cruise Control, and Forward Automatic Braking. With the 2019 GMC Acadia it’s clear how much this SUV was engineered to value safety, including both preventative and protective technologies. Combined with its premium technology, powerful and efficient performance, and full suite of safety features, the 2019 GMC Acadia represents one of the most well-rounded vehicles in its class. This is further proven by its warm reception by consumer and critics alike. And did we mention that the all-new Acadia received a 5-star rating in both its Front Crash and Side crash tests? Carl Black Roswell is proud to be your local GMC dealer. Whether you’re looking for a new, used, or certified pre-owned vehicle, we have you covered. Our extensive inventory features only high-quality, well-maintained vehicles, and we are passionate about each and every one of them. If you purchase a vehicle at our dealership, you can feel confident that you’ll be able to depend on it for years to come. Not to mention that you’ll be purchasing it at a competitive price. Once you’ve chosen your perfect vehicle, our financing team will be there to help. At-the-ready with local and national banks our finance team will use all of their resources to help you secure the loan or lease that works best for your lifestyle and budget. Not sure what to expect for your new monthly expenses? Our finance center will take the time to walk you through the cost of your monthly payment, insurance, and any regular maintenance or repairs in the future. And of course, when it comes time for maintenance and repairs, the service center at Carl Black Roswell will be ready to service your vehicle with premium parts. At Carl Black Roswell, we strive to take care of all of your automotive needs with the greatest service in the area. From searching for your new car to financing and maintenance, we’re here to help. So, when it’s time to look for your next vehicle, visit the knowledgeable staff at Carl Black Roswell.